In the past three years Walt Disney Company has acquired Pixar, Marvel Entertainment, and now Lucasfilm for an astonishing total of $15.4B. Disney was already the #1 entertainment producing company but this will ensure that it will never budge from that top spot. Lucasfilm grosses an estimated $25B annually in total receipts (movies, toys, costumes, etc.). What will Walt Disney Co. do with this? Theme parks? More movies? 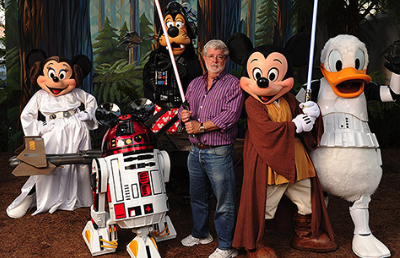 Rumor has already hit the web that Disney is planning to launch the 7th edition of the Star Wars franchise by 2015. With the backing of Disney it is fair to assume it will surpass record numbers when it hits the box office. As most of you are already aware, I am a Disney fanatic (my Disney animated classic DVD collection can prove this). The news came as a pleasant surprise yesterday. I will be extremely anxious to see what the masterminds at Disney can do with such a powerful brand. We have already seen the positive effect with Marvel Entertainment and the launch of Avengers this past year. The hit movie destroyed records by grossing over $1B in just 19 days. The future continues to look extremely bright for Mickey Mouse and all associated with Walt Disney Company. You have to believe that Walt Disney, himself, is smiling somewhere! Sports Wagering…Should It Be Legalized in NJ? A friend sent this article to me last week and I wanted to share. He knew I would find it extremely interesting as I was connected to the sports industry for so many years. Governor Christ Christie is leading the attack with a strong case at winning this historical event. I would love to hear your opinions on this as it will change the face of sports wagering throughout the country.